In hopes to snare customers passing that way. Onto every clothing rail, counter, and shelf. Says leave half a bottle for Donner or Blitzen). To celebrate Christmas, you need the right gear. Adventured a Baileys on top of a Stella. 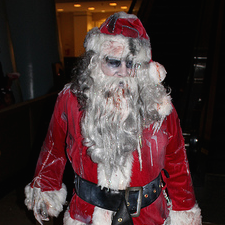 By dishing out mince-pies to zombie St. Nicks! To accommodate luminous remnants of trees. And settled herself to a large pay-day loan. At a penguin receiving a mail-order bride. Between clearing one plateful and going for more. …Would anyone choose to be born on this earth? P.S. Yes, yes ... I know it's been done and done and done and then some. Well, now I've done it too. Good to remind ourselves of the biblical ad(vent) penned over centuries by various people ... behold a virgin will conceive ... probably the least effective ad ever - no-one believed it, few were ready, but happen it did!